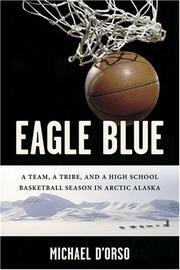 An intimate look at how a high-school basketball team carries the flame of ethnic pride for the native citizens of an Alaskan bush village. Readers familiar with D’Orso’s investigation of the modern despoiling of the Galápagos Islands (Plundering Paradise, 2002) will rightly suspect that there’s more afoot here than a rousingly inspirational parable of local basketball. Indeed, his story of 14 athletes, a coach and their families experiencing a typical season in Fort Yukon, where excellence in the sport is demanded, unfolds in a foreboding atmosphere of cultural conflict. The overwhelming majority of Fort Yukon’s residents, players and fans included, are Gwich’in tribal natives, a subset of the Athabascan Indians (not the ethnically disparate Eskimo peoples) who populated Alaska’s interior long before the U.S. laid out a bargain-basement $7.2 million for its real estate and natural resources. The author has no trouble finding a Gwich’in spokesperson who equates that historic purchase with the “theft” of Manhattan for $24 in trinkets and beads. The spokesman also laments the inevitable erosion of traditional skills and values brought on by “mailbox money” (monthly stipends from billions in oil revenues and drilling-rights settlements with native tribes) even while he, like the others, regularly cashes the checks as a buffer against abject poverty. D’Orso fills in the background: Servicemen posted to Alaska’s Cold War radar installations brought gymnasiums; pioneer Gwich’in hoopsters not only picked up the finer points of the game but unabashedly recall that they were seen as “quick” even by the black players who taught them. Fort Yukon High’s Eagles carry on the tradition, crisscrossing Alaska by van and bush plane in the subzero winter to perennially challenge larger schools for a state championship that, today, validates the character and essence of a people in the twilight of assimilation.